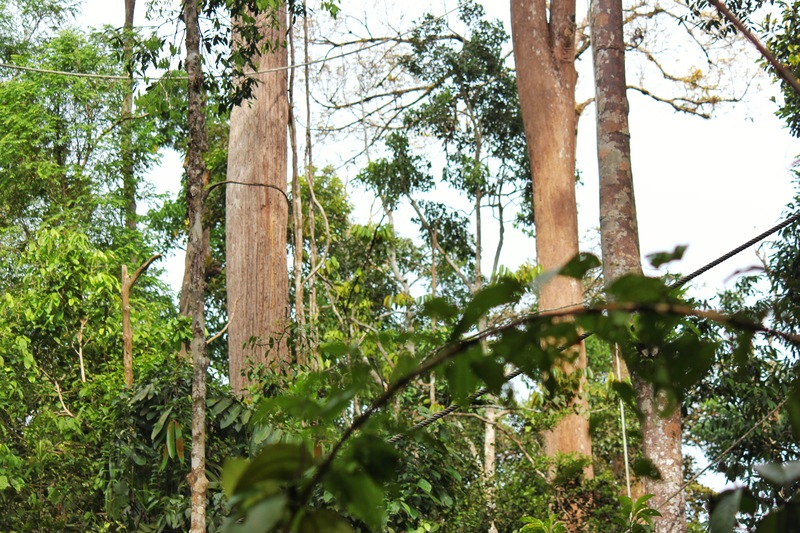 When you’re waiting for orangutans, you watch the tops of the trees. It’s about as exciting as it sounds, mostly. You watch the leaves and the branches swaying in the wind, then you look in a different direction, and then you look back and forth wondering when something is going to happen. A more culturally insensitive man than I might compare it to soccer. You try to keep your hopes and expectations down, because the guide said that some people come five or ten days in a row and never see an Orangutan and go home sad, and you’ve only been out here five minutes, so what can you expect, and then you suddenly notice that one of the tree tops you saw before isn’t there anymore. Then another tree starts wiggling like a caught fish at the end of a line, and then it starts to bend, and the first tree top – the missing one – sways back into place, and that second tree starts to shake wildly, then bend under some invisible weight. For a moment the trees go still again, but you know without being told: there’s an orangutan on one of those trees now, and it’s watching me. 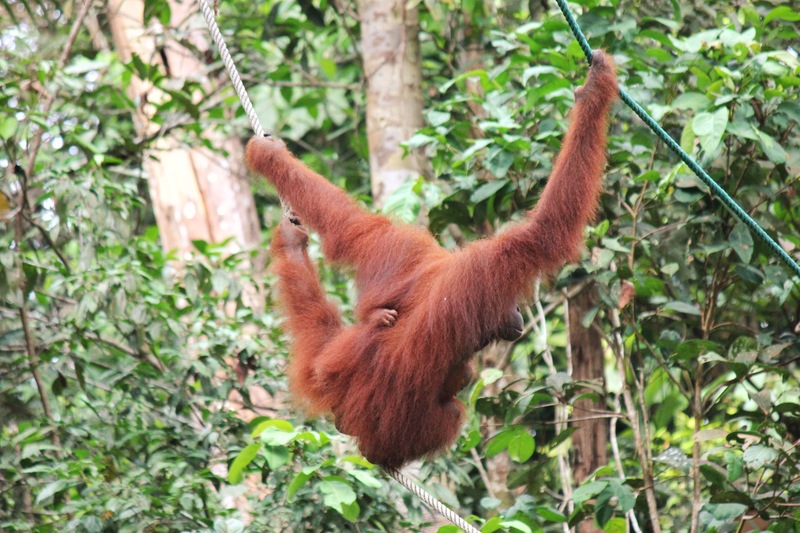 And with that realisation comes another: how many orangutans are sitting out there on trees, still as death, watching? And: could they kill me? The answer to the latter question: oh absolutely yes. Orangutans are several times stronger than humans, and the big males can have a arm-span of nine feet, meaning that they could swipe their hands – huge, black, steely strong – into you without you having a chance to touch them. They could also pick you up and throw you against a tree with one arm while the other arm holds a branch and each of their feet lightly holds a coconut, or a durian, or another branch, and then they could swing up, let go of everything, land on you and jump you to death. You think about how much power could be put into those feet as they pop your internal organs like balloons and then the tree leaves shake again and your heart starts pounding. The first one to appear, a ten-year-old male, puts on a show. He climbs up a tree, finds a branch, and swings to another tree, then shimmies down, weaving in and out of sight, moving vertically and horizontally, exhibiting an understanding of multiple dimensions of space that you could only dream of. Then, suddenly, he is in the clearing, and he pauses magnificently at the edge, his body spread out both casually and powerfully. You remember your friend Charles Michener, who interviewed Marlon Brando right after Brando had made it big for the first time. Charles went to Brando’s hotel room, and Brando was in bed, in his underwear, and they did the whole interview like that. In your mind, Brando’s body language matched this orangutan’s body language – casual, dominant, cool, just hanging out in his element with nothing to prove. What is Charles doing now? You sent him two postcards and an email and heard nothing. You make a mental note to send him another, then promptly forget. 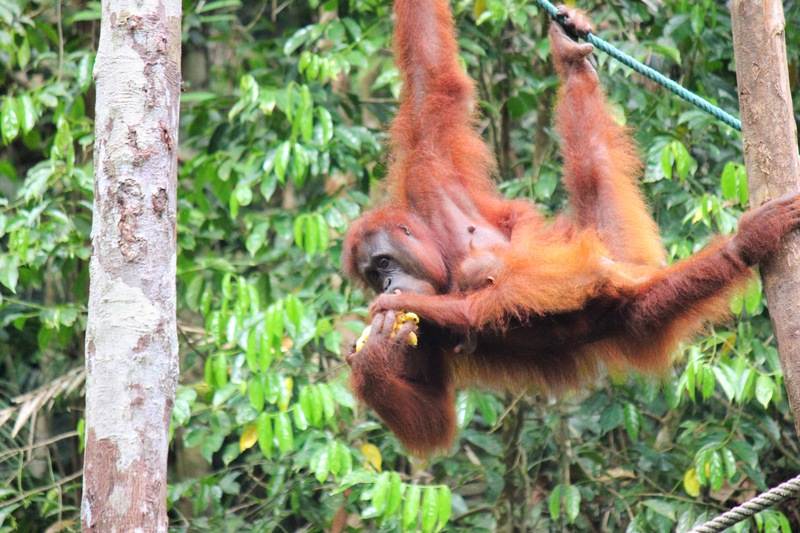 The orangutan swings down to where the fruit has been placed by the rangers and sways above it. A ranger walks over, confident but cautious, and the orangutan’s hand reaches out, maybe three meters above the fruit, waiting. The ranger knows the drill, and tosses a bunch of bananas up, which the orangutan catches and immediately starts devouring, one by one. They are tiny bananas, the kinds you can eat in a single bite. He twists one off, peels it, then smashes it into his mouth whole, pretty much the same way you do, except your wife tells you it gives her indigestion to watch you eat like that, but when an orangutan does it it’s “natural.” He drops the skins casually to the ground. When he’s done with the whole bunch – maybe 25 bananas – he reaches down again, and a durian chunk is thrown up to his waiting hand. He lifts it to his mouth and takes a bite, the something falls out of his mouth and hits the wood below with a ping. This is repeated for every giant durian seed, and you long to have one as a souvenir to give to your niece and nephew. “Here’s a durian seed,” you would say. “It’s a fruit that smells like vomit and is banned from most hotels in Southeast Asia. An orangutan spit it out, and I grabbed it for you.” They’re young, and you’d be a hero. But you can’t go and get one, so you take pictures. After a while, this one gets boring, just sitting there eating, so you walk to another feeding area, but it is empty. Again, you watch the treetops patiently, and then you see some leaves start shaking, and then the bend. Another orangutan suddenly shoots out into the middle of this clearing, pauses, and drops herself down the tree branches to the platform, hovering right above it. Her back is always to you, and there’s a hard knot of scar tissue poking out through the hair; she has been injured, but survived. Then the scar moves, and you see the arm, and you realize you’re looking at a mother and her baby. The same feeding ritual is performed for her now, but with the added glory of motherhood. Your sister-in-law gave birth the day before, and you wonder what the mother in front of you goes through every day so its baby survives, and if it is anything like what a first-time mother goes through in Richmond. Does this baby cry? How does it feed? Are there orangutan equivalents to the fancy baby buggies and ipad games and Genius Baby products thrust on new parents these days? What if your sister-in-law had to swing through branches in the forest; would her baby hold on successfully, or fall? How does this baby know to shift its weight from one hip to the other as the mother reaches down to catch more food? At the second bunch of bananas, the baby orangutan reaches over to try to grab one, and the mother pulls them out of reach, then finally acquiesces; what lesson was she trying to teach her child by denying it food? Did it not say “please”? And as you’re captivated by this universally adorable display of motherhood, a tree shakes, and everyone – your group, the ranger, the mother, the baby – looks over. The mother seems to know better than anyone what is happening, and reaches down; the ranger throws up a coconut, which she holds in her foot, and then a piece of durian, which she holds in her teeth. Then, with her remaining limbs, she climbs and climbs and climbs and swings into a tree branch, and when you look back to where the trees were shaking, you see a giant male, completely still, hanging from a rope. In The Charisma Myth, the author, Olivia Fox Cabane, proposes that being still is a very charismatic behaviour. To prove her point, I think she asks the readers to imagine James Bond fidgeting. You can’t, can you? Because fidgeting is a sign of weakness, and being still is a sign of dominance, of power, and you never really understood what she meant until this very second, because the most charismatic people you know are constantly in motion – perhaps not fidgeting, but also not completely still. This orangutan isn’t moving, but you instinctively know that everyone and everything in eyeshot of him is paying attention only to what he is going to do next. When he finally decides to descend, you forgive yourself for forgetting that there’s an adorable baby eating coconut, because the descent is magnificent – slow, controlled, intentional. When he gets near the fruit, the ranger tosses up some bananas with the same sense of caution that he’d used with the others, but this time there’s something more. You only realize what it is a few hours later, when you have had time to think. The ranger is submissive. He won’t hold eye contact; he almost scrapes and bows as he serves food to this alpha male, and you realize where courtly customs must have come from – a place of safe, primal deference. If the ranger had bowed low and swept his hand out, you would have forgiven him. You’re not sure you would have done differently if you were that close to jungle royalty. 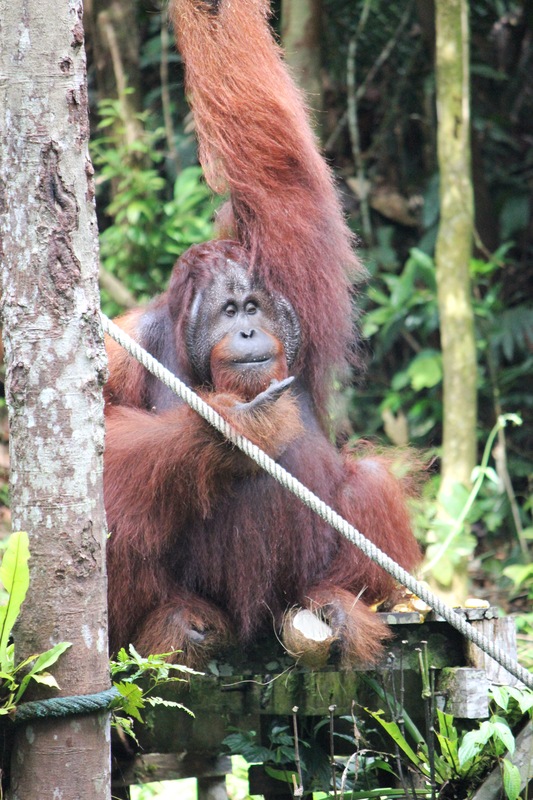 After the bananas and durian, the male waits, one hand clutching a rope, one foot on the ground, the other foot propped against a log – simultaneously relaxed and ready to spring into action. The ranger brings over a coconut and places it at the male’s feet…and the male doesn’t move a muscle. For a moment there is what can only be described as an awkward pause as the male stares down at the ranger; you can’t see his face, but you can imagine the contempt in his eyes. You know the ranger feels it because he comes back with a hunk of durian; the male accepts it, and you hear the German girls next to you exhale, and you realize you were holding your breath, too. The male sits down, and for the next five minutes the only sound you hear is the wooden thwack as the durian seeds hit the feeding platform and roll off. Then he reaches over, picks up the coconut, rips the shell off with his teeth, and smashes it against a tree, spilling the water all over his fur. A momentary flash of embarrassment passes over his face. You think you couldn’t be anthropomorphising that, but right then the ranger announces that it is ten o’clock and feeding time is over. You go to the crocodile pond, and see the sad crocodiles in the grass, and then the visitor area, but the main event is over, and everything is anticlimactic. But later, when no one is watching, you practice being still, and vow to try it out in public sometime – maybe when ordering dinner, maybe when sitting in a bar – just to see what happens. We are all animals, after all. Previous Everyone speaks English. English speakers should learn Romanian. Next Where should we eat?